in 168 progressiv geordneten Lectionen, mit Sonatinen, Duetten etc. Em. Professor der Königl. Academie S. Cecilia zu Rom etc. etc. 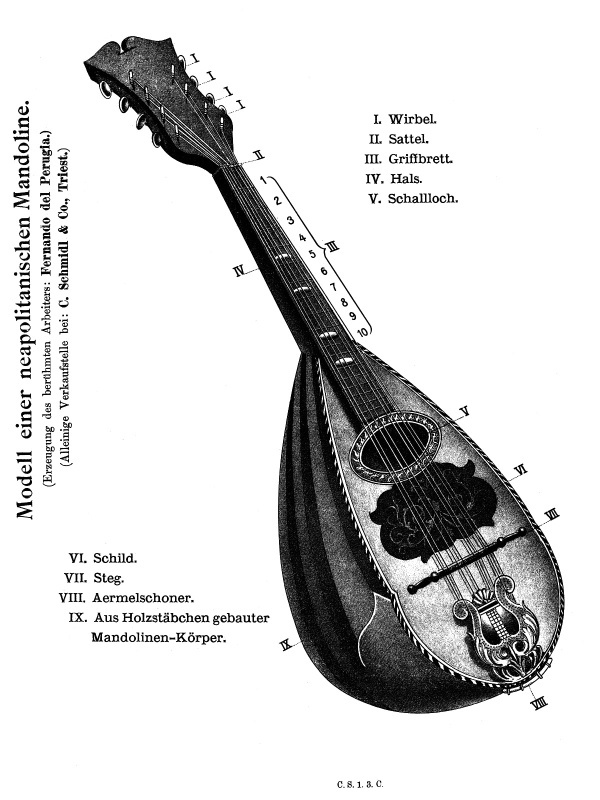 Die Mandolinenschule von Branzoli ist eine der frühesten umfassenden Mandolinenschulen des 19. Jahrhunderts. Mir ist nur noch eine frühere Mandolinenschule bekannt, die Schule von Carmine de Laurentiis (1869) - diese ist mit ca. 30 Seiten aber sehr knapp und behandelt nur die Grundlagen der Technik. 1890 überarbeitetet Branzoli die Schule, die erweiterte Ausgabe in zwei Bänden wurde im Industrie Palais zu Paris ausgezeichnet. Die amerikanische Ausgabe in einem Band die als Download verfügbar ist (siehe unten) basiert möglicherweise auf der ersten Ausgabe. 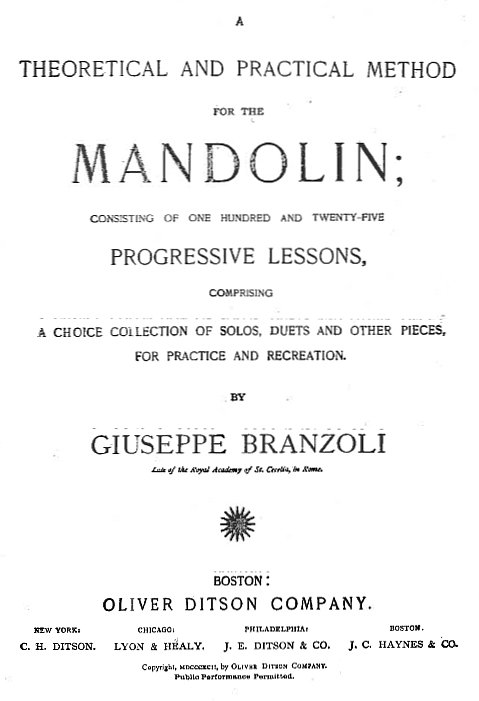 The mandolin method by Branzoli is one of the earliest mandolin methods published in the late 19th century. I do only know one earlier method, the mandolin method by Carmine de Laurentiis published in 1868. The method by C. de Laurentiis however is very short (30 pages) and does only cover the basic technique of the mandolin. 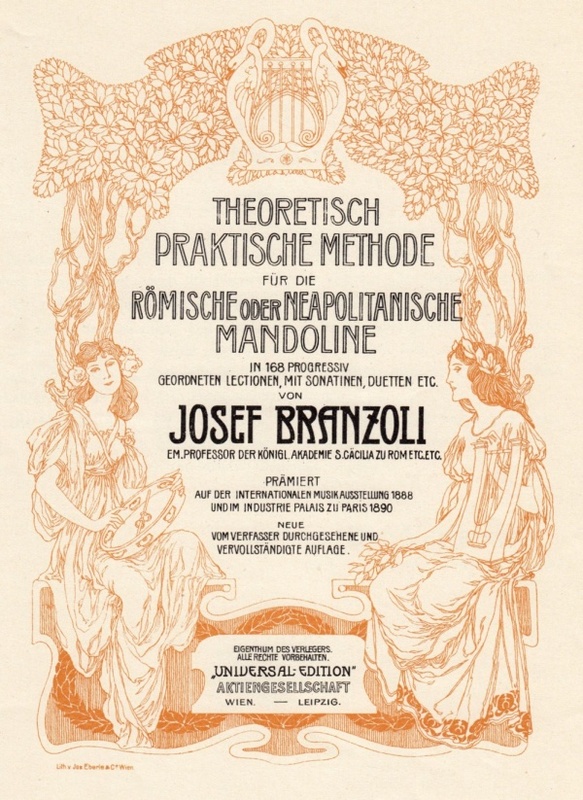 The method by Branzoli was published in 1875, the second enhanced edition was published in 1890. You can find more details about Branzoli and the methods in the biography futher below. Branzoli, Giuseppe, born in Cento, near Bologna, Italy, died January 21, 1909, in Rome. As a young man he was gifted with exceptional musical talent and made rapid progress on the violin, which he studied in his native town. He was fond of music and it was not long before he commenced to teach the instrument in Cento, afterwards removing to a more important and enlarged sphere in Bologna. It was in this city that he made himself known as a composer, being at the time engaged as first violinist in the orchestra of the Theatre Apollo in Rome. In 1870, after the loss of his son Pietro—who was born in Cento—Branzoli suffered considerably from melancholy, and during these severe attacks of depression, neglected his art; but it ultimately emerged victorious and he was once more occupied in its ministrations, now in the orchestra of the Theatre Massimo in Rome. With renewed energy and devotion he dedicated himself to music as a means to stifle and conquer his grief. He interested himself in the founding of the Liceo Musicale di St. Cecilia in Rome, and to this day his name may be seen carved in the masonry of the entrance hall. Branzoli was appointed a professor of harmony in the new institution : he had previously been the conductor of the Philharmonic Society and a professor of stringed instruments. While in Rome he commenced the literary branch of musical art, devoting his attention principally to historical musical research, and in this he had the co-operation of Professor Rodolfo Berwin, who, like himself, was engaged in the library of the Royal Liceo Musicale di St. Cecilia and of which institution Branzoli was for some years librarian. He was intensely anxious for the advancement of the mandolin and guitar, and, fired with this one ambition he founded a music journal in Rome, the first number of which was published January 15, 1907. This periodical, Il mandolino Romano, was issued in the interests of the mandolin and guitar and contained historical articles concerning these instruments, contributed by Branzoli, in addition to music by various composers. He continued this journal up to his death, January 21, 1909, and in the following number of this periodical, an eulogistic sketch and appreciation of his career was published, with an elegy to his memory—a duo for mandolin and guitar—composed and dedicated by Cav: Modesto Rasa. This journal was continued for two years after his demise and then ceased publication. Branzoli was the author of various compositions, for the violin,mandolin, flute and violoncello in particular, and some church music; but his principal works are his methods of instruction. He has left several unpublished manuscripts for mandolin, guitar, etc., and an elegy, Op. 18, for orchestra, entitled : A tear over the tomb of Meyerbeer, is in the possession of Ricordi, Milan. His Theoretical and practical method for the mandolin was originally published by Franchi in 1875 and was afterwards acquired by Venturini. It is issued in the French and English languages and proved very successful, consisting of two books, each containing progressive studies in the form of sonatas, and also duos for two mandolins. In 1888 it obtained the first prize at the International Music Exhibition of Bologna, and in 1890 Branzoli revised and augmented it and the same year the new edition was awarded a similar honour at the Palace of Industry Exhibition in Paris. 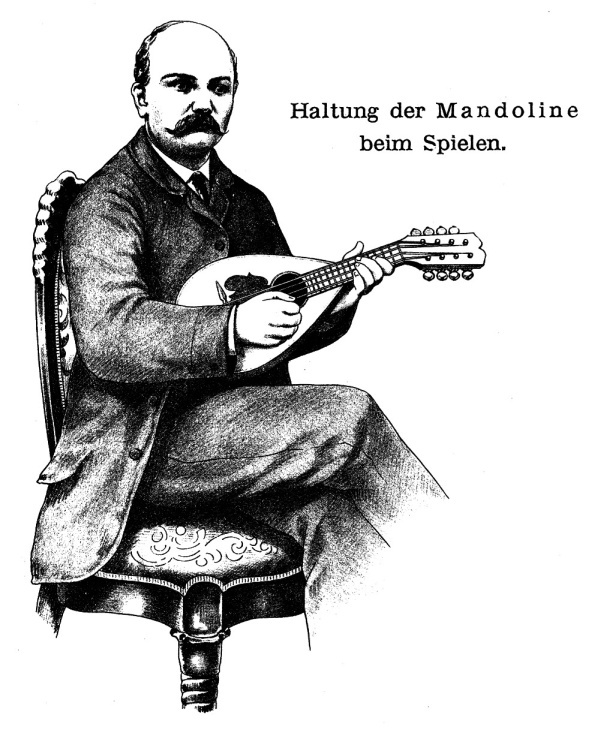 Branzoli also wrote a Theoretcial and practical method for the Milanese mandolin, published in Italian and French, and issued by the publishers of his Scigolidita (Studies of velocity) for the mandolin. Part i. of this series contains forty-eight exercises in the first position and part ii. forty studies in all positions, in addition to arpeggios and chords. Both his method for the guitar and that for the lute, contain a short history and illustrations of the respective instrument. 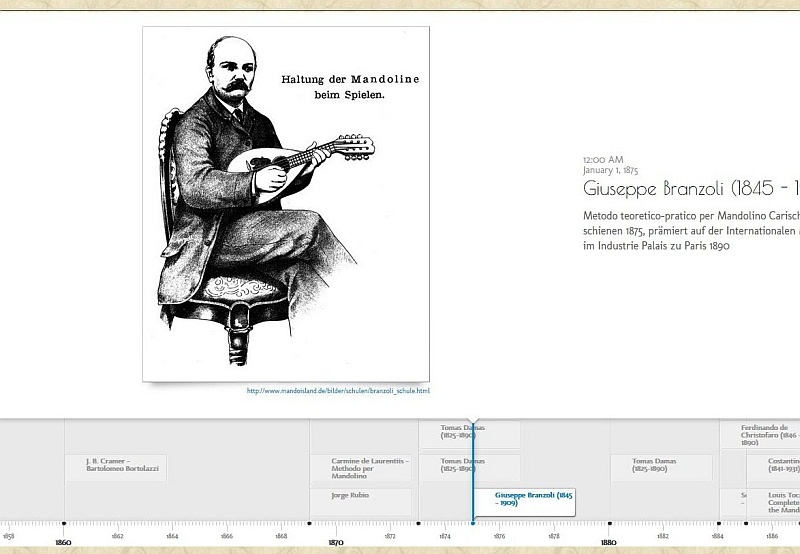 About a dozen of his compositions were for mandolin band, but these did not attain the popularity of his methods; his name, however, is highly esteemed by all mandolinists and a mandolin band of repute in Rome was known as the "Mandolinistica Branzoli." Branzoli was the author of two operas : Torquato Tasso and Sorrento, both being represented in Rome Avith success. His musical research was made public in two literary volumes: The lute and its story and Historical handbook for violinists. Both display his erudite knowledge of these subjects: they are fully illustrated and written in an attractive, commendable style. In his volume, Historical and practical method for the lute, dedicated to H.M. Queen Margherita, Branzoli describes himself as "Honorary Professor of the Royal Academy of St. Cecilia, Rome, and also of other scientific societies." This is one of the most valuable treatises on the instrument, containing diagrams of ancient lutes, including an illustration of a specimen made by Stradivari in 1700. The practical part treats of the ancient notation for the lute, with numerous examples of lute music by ancient writers, transcribed in modern notation by Branzoli. This work was published in 1891 by Venturini, Florence.